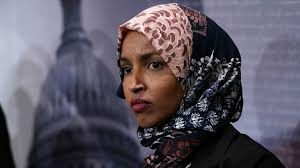 Congresswoman (painful to say) Omar is like a crying child who has spilled Milk and yells at everyone for making her clean it up. She continues to complain that she is being treated poorly even as she is the one who continues to litter the floor with her mess. I believe the Congresswoman (painful again) should realize hate matters when you take such a high office in this land and once MSNBC and the Democratic elites stop cleaning up her mess maybe she will grab the paper towel as well.